The PolySurF products are functional monomers and additives that are used for UV-curing and emulsion polymerisation. PolySurF can be used as adhesion promoter and polymerisable stabiliser. End uses include wet-scrub improvement of emulsions, adhesives, bonding agents, detergents and cleaners. 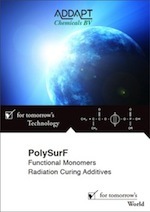 PolySurF ACE is a solvent free polymerisable additive. It imparts benefits like: acid resistance, high gloss, excellent pigment wetting, water repellence, film appearance, UV stability and improved adhesion to thermoplastics. PolySurF HP is a solvent free UV-curable additive. It can also act as a co-polymerisable anionic surfactant and/or adhesion promoter with flame retardant properties. PolySurF HPH is a solvent-free UV-curable additive. It can also act as a polymerisable hydrophilic non-ionic surfactant and/or co-polymerisable plasticizer. PolySurF HPL is a solvent-free UV-curable additive. It can also act as a polymerisable lipophilic non-ionic surfactant and/or polymerisable plasticizer. PolySurF HPm is a solvent free UV-curable additive. It can also act as a co-polymerisable anionic surfactant and/or adhesion promoter with flame retardant properties.